-7- NOTES ON PDQCOB PDQPL1 1. To obtain a map of the object module, PARM=/PRINT, MAP must be specified on the EXEC card. To obtain error messages from the loader, the PRINT option must be specified (with or without MAP). In a 100K region, the loader will load object text up to a 80K. 98K of the 100K region is available for program execution. For programs requiring more than 80K for object text, a larger region must be specified. In addition, programs requiring more than 100K for object text, must code a size option in the parm field: SIZE=nnnK where nnn is from 102 through 200. The corresponding region size must be (nnn+20)K 2. To concatenate user libraries (e.g. STALIB) the following is required: //procname.LIBRARY DD DD DSN=userlib, etc procname is COB, PORT, or PL1 for the respective compilers. These cards must appear after the EXEC card. 3. PL1 programs that require printing of lines longer than 120 characters must DECLARE SYSPRINT with the ENVIRONMENT option or OPEN FILE(SYSPRINT) with the LINSIZE option to get the correct length. NOTES ON WATFOR 1. WATFOR libraries must be concatenated following the WATFOR function library. They cannot replace it. 2. BLKSIZE of user libraries must be 800 bytes or less and a multiple of 80 bytes. 3. 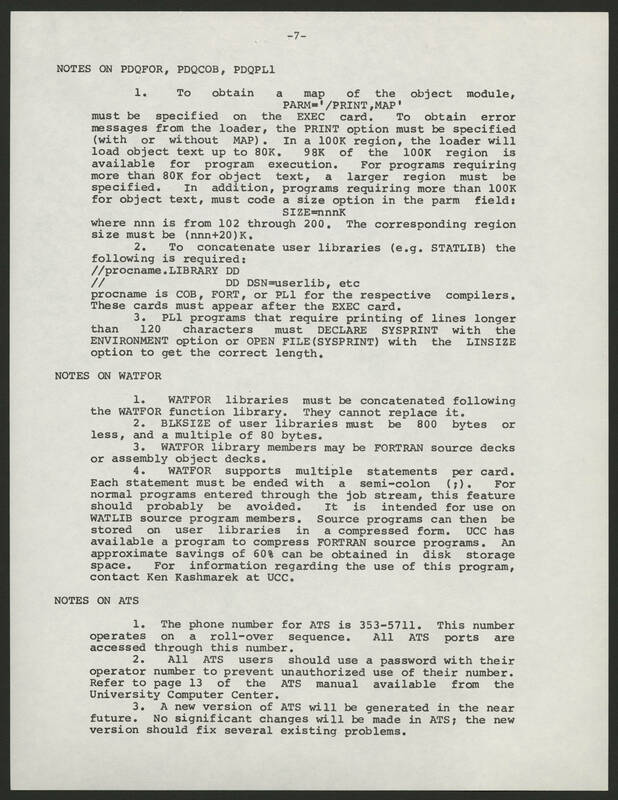 WATFOR library members may be FORTRAN source decks or assembly object decks. 4. WATFOR supports multiple statements per card. Each statement must be ended with a semi-colon (;_. For normal programs entered through the job stream, this feature should probably be avoided. It is intended for use on WATLIB source program members. Source program can then be stored on user libraries in a compressed form. UCC has available a program to compress FORTRAN source programs. An approximate savings of 60% can be obtained in disk storage space. For information regarding the use of this program, contact Ken Kashmarek at UCC. NOTES ON ATS 1. The phone number for ATS is 353-5711. This number operates on a roll-over sequence. All ATS ports are accessed through this number. 2.All ATS users should use a password with their operator number to prevent unauthorized use of their number. Refer to page 13 of the ATS manual available from the University Computer Center. 3. A new version of ATS will be generated in the near future. No significant changes will be made in ATS, the new version should fix several existing problems.